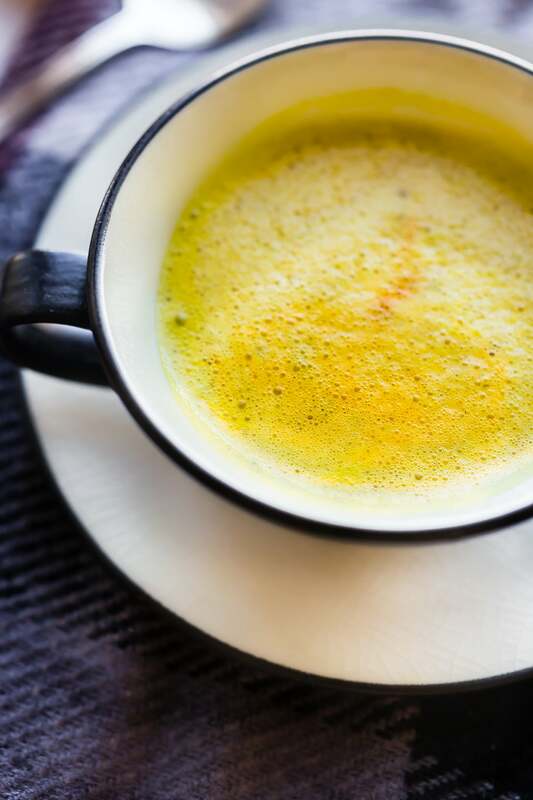 This Orange Turmeric Tea Latte will boost your health and energy! It’s a cold-busting vegan latte, loaded with extra Vitamin C, brain-boosting healthy fats, minerals, and anti-inflammatory properties. 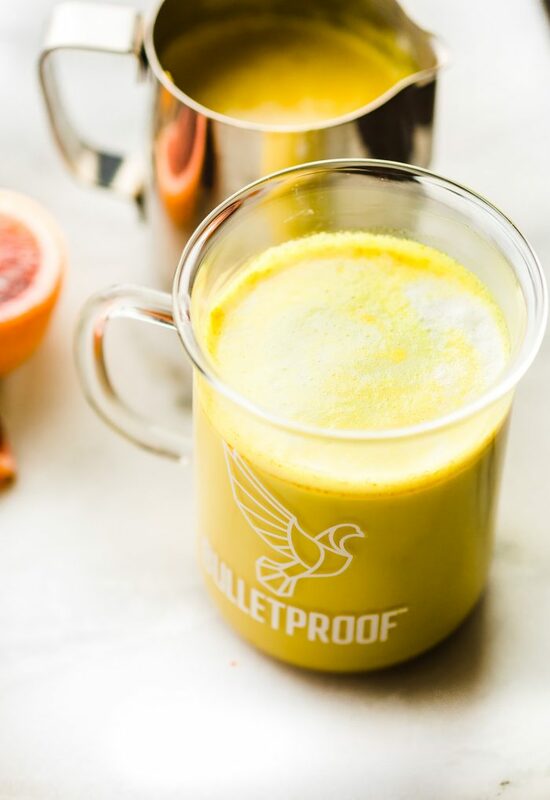 A fruity, caffeine-free bulletproof latte that’s warming and nourishing! Paleo friendly. 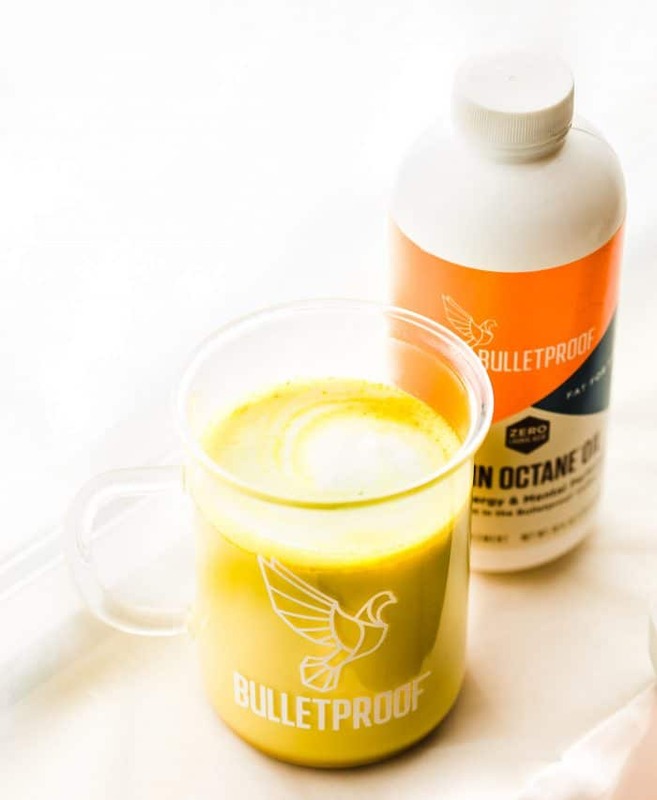 We’ve partnered with Bulletproof Brain Octane Oil in this Updated version of my Vegan Turmeric Tea Latte recipe. We’re retested, added more photographs, updated nutrition content. Now I am republishing it for you today! I hope you enjoy. Thank you for following Cotter Crunch Y’all!. Gimme all the brain power, immunity, and energy please! 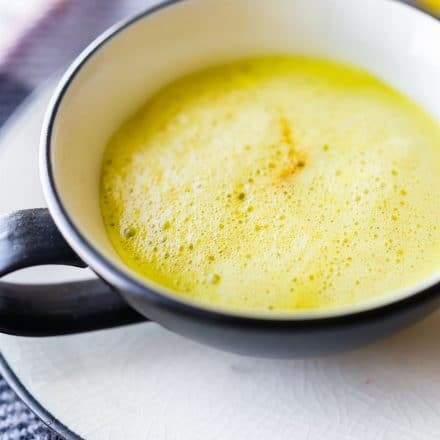 This caffeine free Turmeric Tea Latte might just cure all. As I sit here coveting a cup of turmeric tea latte (in conjunction to typing this post), it’s 65F outside. Mind you just 2 days ago I was shoveling a blanket (or 3) of snow from my drive away after. Can I confess something? I don’t mind it. In fact, this Texas girl thinks it’s so pretty! It brightens up living room but at the same makes me feel cozy. Ya, I know, I’m that weirdo who’s never seen so much powdery snow. Until we moved to Utah a year ago! What I don’t like is that the ups and downs of the temperature all also brought an up and down of seasonal allergies, brain fog, and a wee little cold in APRIL! Bah-humbug! My poor husband got a double dose of a migraine as well. It came then went then came again. Thankfully I think we beat it for good this time! I’d like to credit my amazing bulletproof turmeric tea latte skills to that. Okay, I may be exaggerating, but still. Do you even know how magical this golden milk latte is? SUPER HEALING POWERS! 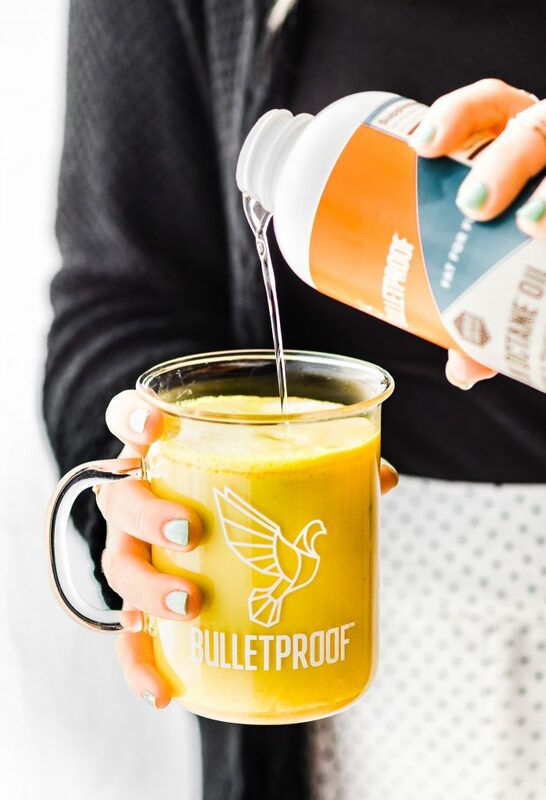 It all begins with a double dose of turmeric, healthy fats from the brain octane oil (MCT oil included), and vitamin C rich foods. 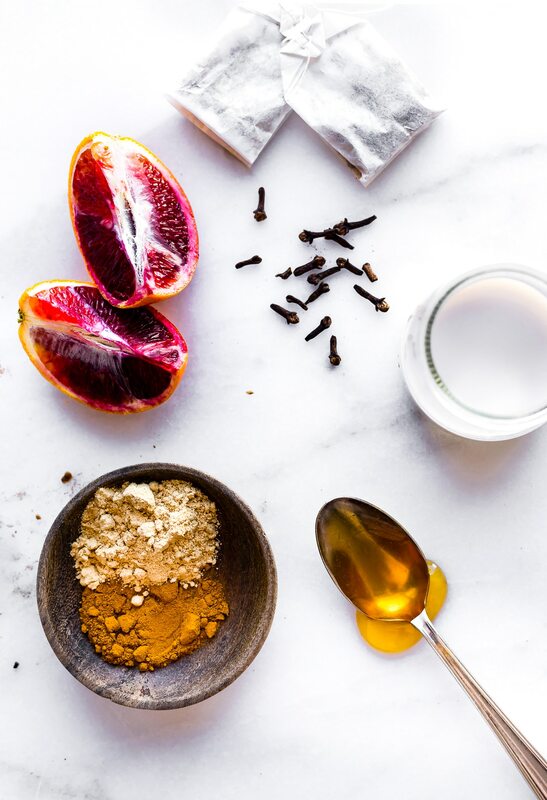 These ingredients; orange juice (or in this recipe, blood orange juice), turmeric spice (rich in Curcumin; active constituent of turmeric), coconut milk and oil, maple syrup, herbal tea, vanilla, ginger, nutmeg, and cinnamon make up one powerful “golden milk” tea latte. 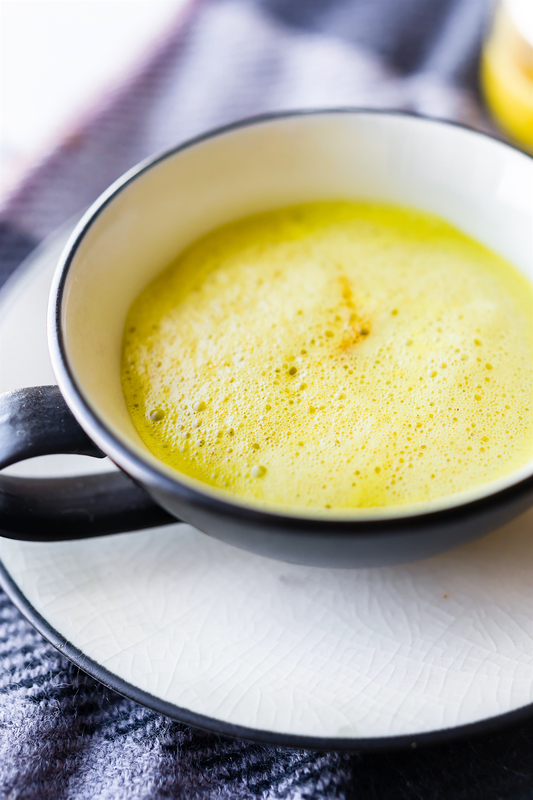 I wasn’t lying about those heavenly ingredients in this Turmeric Tea Latte! The “GOLDEN GATES” of healing. See what I did there? Puns, always. I should note, that using blood orange has less acidic taste, so it’s perfect for a sweetener boost! Anyway, let’s chat more about each ingredient. I’ve been dying to get nutrition nerdy with turmeric again! Orange juice (or blood orange juice) – We all know that oranges are rich in Vitamin C, but did you know that blood orange is actually higher? 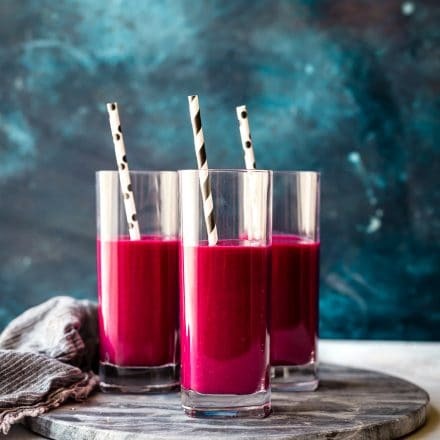 Yes, they have a more concentrated amount of Vitamin C and higher amounts of the flavonoid pigment anthocyanin (a disease-fighting antioxidant). The pigment that gives them that red color! Plant power ya’ll! 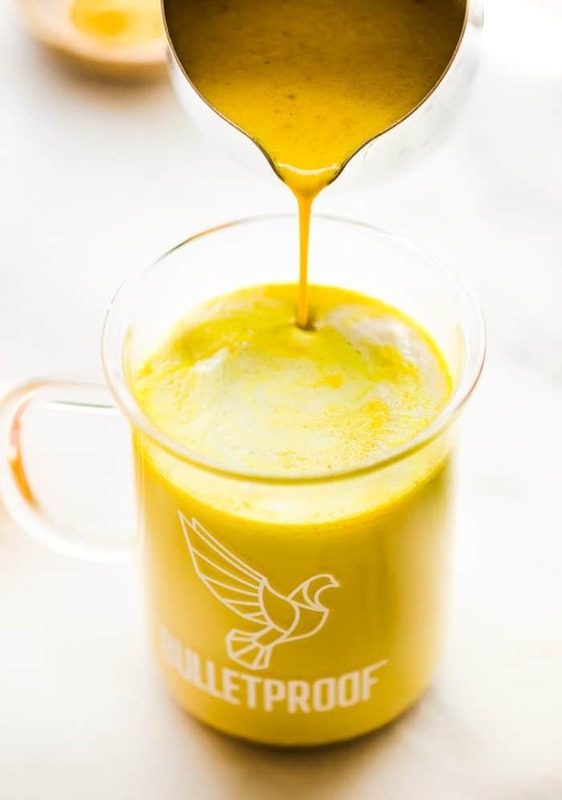 Turmeric spice (rich in Curcumin; active constituent of turmeric) – Studies have shown that Curcumin has antioxidant, anti-inflammatory, antiviral, antibacterial, antifungal, and anticancer properties. Ya —> ULTIMATE HEALING! Unsweetened Almond or Coconut milk – Dairy free, vegan milk. 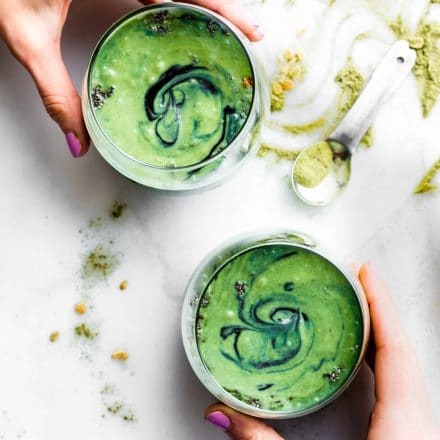 Rich in Minerals Almond milk is rich in antioxidant Vitamin E.
Bulletproof Brain Octane Oil – A quick source of pure energy from quality MCT oil. Helps fuel your brain and body. Maple syrup (or raw honey if you are not vegan) – Natural sweetener rich in minerals. And anti-bacterial due to its phenolic compounds! This means Maple syrup could help fight unwanted bacteria (pathogens). Um, like a virus. Like the one we had. Herbal tea – Rich in anti-oxidants, soothing, calming. Made from herbs, fruits, seeds, or roots then steeped in boiling/hot water. Ginger, Nutmeg, and Cinnamon – Great for easing digestion, anti-inflammatory properties, and of course anti-oxidation properties. Which means it can help fight that oxidative stress going on in your body. Stress from being sick, over working, overtraining, life. All of the above. 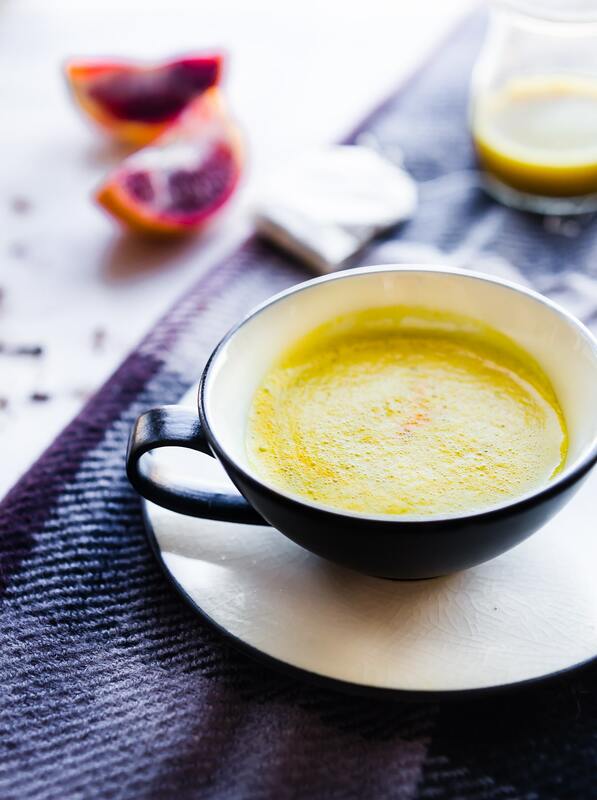 Boost your health with a cold busting vegan orange turmeric tea latte! 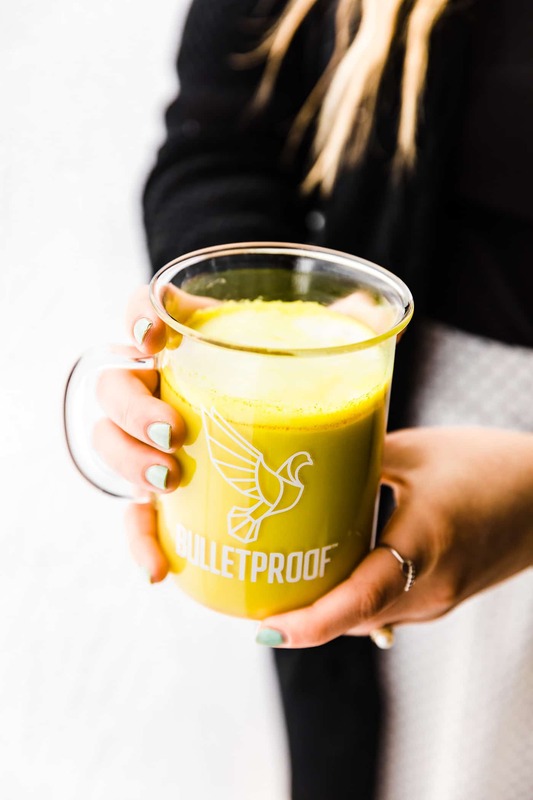 This bulletproof “Golden Milk” latte is loaded with extra Vitamin C, rich in minerals, and anti-inflammatory properties. 2 herbal tea bags (like ginger tea, orange hibiscus, or herbal tea of choice). 6 oz almond milk, other dairy free milk, or water. Steep your tea bags in 6 oz of dairy free milk or water. You want the tea extra concentrated. Next place 10-12 ounces of coconut or almond milk in small pot. Add your ginger, cloves, turmeric, cinnamon, orange juice, maple syrup, and optional nutmeg. Whisk together. Bring to a soft boil, then reduce and simmer for 5 minutes to extract the spices. And until maple syrup is dissolved. Add vanilla extract here if you want. About 1/2 tsp. Mix again. Strain the nutmeg if you are using whole. 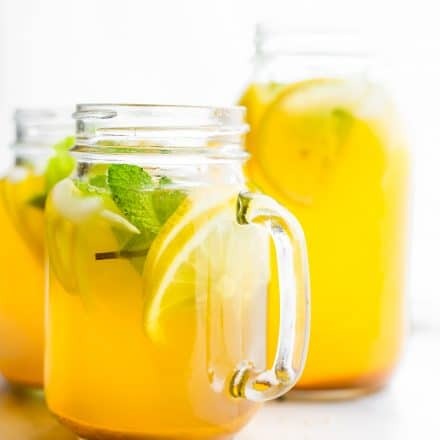 Pour 2 – 3 ounces of the brewed concentrated tea you into a cup. Whisk your golden milk (the mix in the pot) again so create a frothy textures. You can also just use a frother. Pour 1/2 cup or so over your tea cup to create a latte. Garnish with extra cinnamon and orange peel if desired. I use this Turmeric Root from Simple Organic. 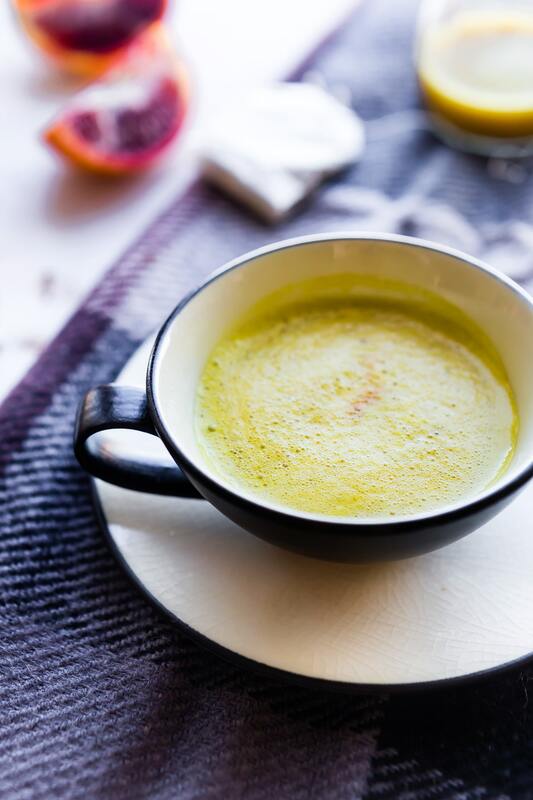 So you see, this Blood Orange Turmeric Tea Latte really does nourish the whole mind, body, and soul! A boost in brainpower, energy, and immunity will have you tackling your day, despite the weather! And in lickity split time! But also, you must believe in the power of real food as medicine. Corny, yes? Placebo effect? Nah! It’s all good and true baby! What’s your cold busting remedy? 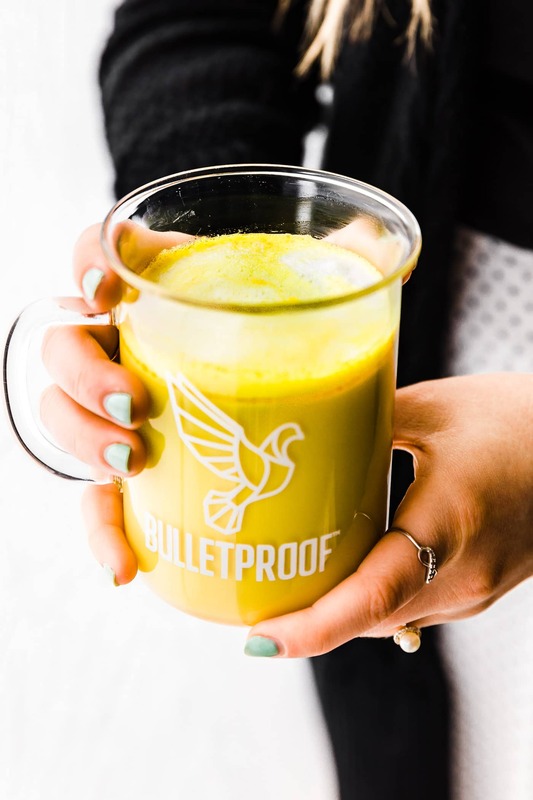 Have you ever tried a Turmeric Tea Latte or a bulletproof tea latte? Navel Orange vs Blood Orange – which team are you on? Orange you glad I asked? LOL! P.S. I once wrote an entire recipe post for blood oranges and the whole time I wrote “Orange Blood.” Let’s just say my brain might need more Octane STAT. ACK! You are the queen of naming recipes and making them! Will you start helping me an mw mine? Lol?!? haha thanks! are you needing help with SEO and titles or style of words? Totally would help if you want. Blood orange all the way. ALLLLLL the way! You know it! Vitamin C powwwwww! LOVE this version, Lindsay. Alllll about the blood oranges this year so I’d be more than happy to add orange to this drink. Thanks friend! Every time I use blood orange I think of you and your cake! I have yet to jump on the golden milk train, but the blood orange here has me SOLD. I cannot wait to try this! This looks like the perfect bevvie to kick a cold!…or just to enjoy and sip on any chilly afternoon/evening. I’m loving all the tasty, nutrient-packed ingredients! 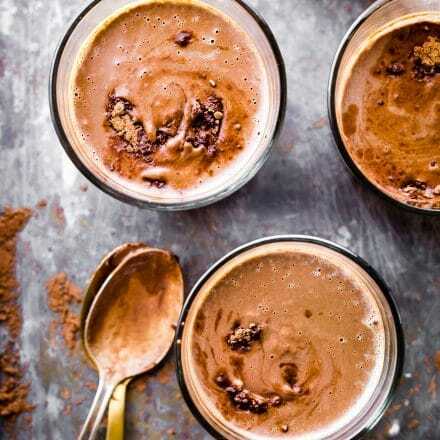 Cheers to a delicious mug of cold-busting bliss! haha i hope i fixed that post by now. Hope you guys are back to 100% soon! We just got over that crud. It was miserable!!! I needed this in my life then. Probably still do. We know we love the turmeric! Oranges… I like them all! Cara Caras are my favorite. Or any orange in the form of a mimosa. LOL! I am glad you are both better!!!!!!!!!!!!!!! Now are you all healed from the operation thing? I’m better! It’s hit or miss each day. Trying to do more weights. I lost a lot of muscle. I deflated LOL! Where was the turmeric in this drink? I was reading your method and couldn’t find at what stage you added it to this drink. sure, it’s in with the spices in step two. You whisk them all together in a pot. Does that make sense? Let me know how else I can help! Hi there- how much nutmeg do i put in? it doesn’t say. oh my gosh this sounds so goooooood!!! i’m super into turmeric lately, but i love that this incorporates so many other flavors and healthy ingredients. thanks for sharing! 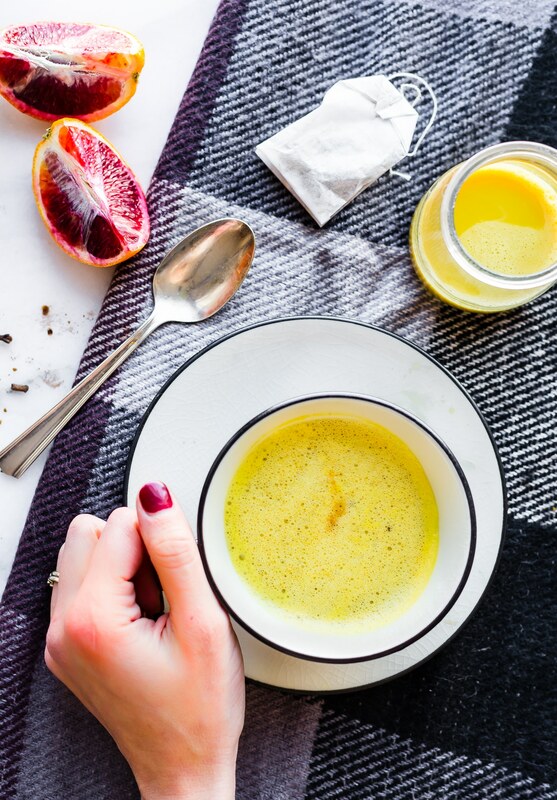 I love that you have such a knowledge of all the cold fighting remedies that God has made; it’s wondrous that food is so healing and so nourishing for our bodies. I’m glad you’re staying super cozy there in Utah; I really loved the snow we got here too! God is so merciful to us. Oo yum! I bet this would be delicious made with rooibos! Oh man, I could have used this last week. Instead I took a lot of steam showers, gargles with salt water and guzzled tea with honey and lemon juice. I like your way better. This is the first thing to help my throat in days!!! Thank you so much! I love everything from your site! Wonderful! So glad it helped. It’s a favorite around here too! First and foremost, I love your article !!!! Truly appreciate all the hard work you put into it! Thank You for sharing such a wonderful post. The recipe mentions both nutmeg and cloves. The picture of ingredients shows cloves but i didn’t see nutmeg. So are they both in the recipe? Oh yes, sorry about that. I mixed it with the cinnamon in the picture. Hope that helps! Keep me posted. I need this in my life right now!! I am going to try a version of this today…fighting a cold/flu that my kids are STILL fighting after a week!! I need all the support I can get! oh feel better! I hope you love this and can feel energized soon! It is delicious!! I used my Bengal Spice tea, and added 1/4 cup full fat coconut milk, and collagen. I also made it low carb sweetening with stevia only, and added some Wild Orange oil for added measure! So warm and comforting, I love it!! Thanks you!! Oh I love Bengal spice. I must try your version! You would love this Tara! This sounds AMAZING! I have never seen so many wonderful flavors in anything! Bring this on! This sounds so good right now! Still freezing here in New England, so I’m all about staying cozy with this sunny latte! WOWWWW this looks like it would be a cold busting wonder. IT’S SOOO pretty Lindsay; and I can almost imagine a nice warm sip of this. so warming and nourishing LOVE that! You must try it! I think you’d love Cassie! HOOK ME UP WITH THIS. You had me hooked when I saw blood orange! Love this drink for anytime, but especially if I get a cold! Yay for blood oranges! I could so use this boost! This looks amazing! I’ll have to try it out ASAP! Looks so good! I can’t wait to try this! So much goodness packed into this latte!! I could sip allll day! This recipe is *literally* golden! Love drinking one of these before bed! Oh yay! Me too Caroline! This sounds delicious and I have everything I need to make it! I would be the only one drinking this in my house. Would this reheat well the next day or should I just cut the recipe down to a single serving? Sure! totally great the next day!